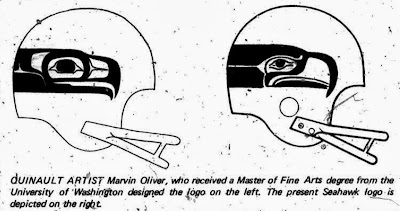 Just about a year before the Seahawks finally took the field, they were in a somewhat similar position as the Washington NFL franchise is now. The logo the Seahawks had been handed by NFL designers didn't directly borrow from local tribal design standards. The King County Arts Commission complained that it "fails to accurately depict the art principles of Northwest coastal Indians." Among the differences found to be inaccurate is the characteristic eye form. The Commission enclosed a suggested correction by Marvin Oliver, Quinault... Oliver depicted regional art principles in the design. It shouldn't surprise me at all, but the original Seahawks design came from people working out of Los Angeles. I kid you not. I can just imagine the designers in the LA spring, cracking some books on Pacific Coast tribes, copying down ideas. (Seahawks general manager) Thompson said the NFL firm did refer to some books on Northwest Indian culture. "Our intent was to follow the Northwest Indian culture, but there was no condition placed on them (NFL) in designing." The Arts Commission further stated, "As with all great art, a full understanding and appreciation does not come quickly. Hence it is not surprising that the new logo fails to depict with adequate sensitivity the arts principles of the Northwest coast Indian peoples." Since that first season, and the back-and-forth between the commission and the team, the logo (especially in the eyes) has strayed even further from Oliver's suggestions (from From Rain to Shine). ...I question my endorsement after my analysis naturally evolves into larger questions about art, identity, acceptance, and what happens when Native cultures live harmoniously (or at least not so adversely) with others? Where we start to move away from imagery of a fan’s foam head towards a fan’s headdress or mask is the face: the two green paint lines on the cheek suggest the 12th Man is wearing “war paint” instead of mimicking the black grease or tape the players use on their cheeks to cut down on glare. Now it’s starting to look more like a hipster appropriation and misinterpretation and I wonder – was the inspiration for this design a transformation mask? I'll link again, because it is worth reading this entire post. I love the data from the American Community Surveys, so much so I wish the Census started doing them in earnest earlier than 2005. So much interesting data, but only back less than a decade. I started poking around the commuter data this week for Thurston County, and found some interesting comparisons between people who drove alone and people who took the bus (or public transportation in general). The first comparison on income is pretty obvious. For drivers, it peaks in the middle and drops off at the ends. Nothing too interesting. For bus takers, the peaks are at the ends, with a much larger peak towards lower incomes. There is a pretty interesting spike at $75,000+ for public transportation, not sure how I'd explain that. This chart I think starts to get into the deeper difference between drivers and bus riders. Again, you see a broad diversity in the drivers, they seem to leave when it is convenient. For bus riders, I think what we're seeing is a hard pipeline of when they have to leave for work, since the buses will only get them there on time at certain times. You also don't see commuters taking the bus early in the morning, since the bus doesn't run that early in the morning. This last one shows the greatest difference, I think, between the two groups. Again, general diversity across the drivers. But, no one takes the bus for commutes less than 20 minutes. In fact, if you do take the bus, you're likely taking it for at least an hour. Big surprise, right? Because remember these signs that tried to connect a brackish estuary with bugs that are prevalent in stagnant freshwater? Anyway, if you head to the section of Percival Landing that crosses the access to the yacht club, you find this sign. The middle panel confusingly refers to the period of time in Olympia of the "long wharf," when Olympia business interests were trying to defeat the mudflats north of downtown to find access to deeper waters for shipping. Eventually, through a combination of building the port peninsula with fill and dredging a basin, those mudflats were defeated by the 1930s. It is pretty spurious to connect this era of filling tidelands and building the long pier to building Capitol Lake in the late 1940s. 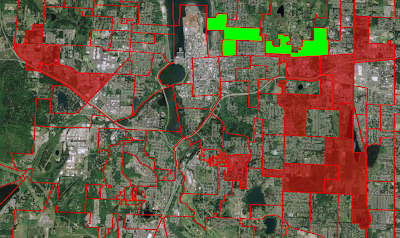 This is really a story of two parts of Olympia, the section facing north trying to find shipping routes and the part facing south, looking at the capitol. These are really two different discussions. It took until the mudflats north of downtown were defeated in the 1930s for the discussion to build Capitol Lake to really his its stride. The Port of Olympia had been created, a channel and basin had been dug, and downtown Olympia had been filled out to meet it. Ironically, it was keeping shipping lanes open to Tumwater that slowed down Capitol Lake for a few years. Tumwater city fathers (including the Schmitds of the brewery) didn't think it was a good idea to dam the Deschutes to stop boats from getting to their city. They were eventually won over, but trying to connect shipping concerns with the origins of Capitol Lake is wrong. But, that isn't to say that the idea of creating a freshwater lake out of part of Budd Inlet didn't have a shipping connection at one point. Strangely enough, in the long tale of where Capitol Lake came from, there was once a freshwater lake solution to the port's mudflat problem. Back in 1903 (eight years before Wilder and White) W.R. Brown put together a small group to try to create a freshwater harbor in Olympia, along the lines of Lake Union in Seattle. Instead of damming the Deschutes estuary at 4th or 5th Avenue, they would go out to Priest Point and build a massive berm there from shore to shore. Like nearly all pre-Wilder and White damming the Deschutes ideas, they were actually to facilitate commerce. The Schmidts of Olympia Beer actually dreamed a plan near to what the yacht club sign describes in 1895. The beer family thought that by creating a lake, they could ensure steady boat traffic to their brewery. But, those plans faded and by the 1910s, Tumwater and the Schmidts were opposed to any sort of damming, up to the point of roadblocking a 1915 plan. Anyway, that's a lot of history to unpack. You can read most of the story here at the Deschutes Estuary history page. 1. Diggers Outlast Geoducks? Really? The entire world of clam related humor open to you and you go with Diggers outlast Geoducks? 2. Utah2 on r/Olympia went for a nice walk. I love getting to the tops of those hills. They're small, but man, what a view. One of my best recollections was around 2007 when there was a bad storm and the power went out. Ian had a bicycle helmet headlamp he lent to you guys so you could continue working in the kitchen since the ovens remained hot and we all ate by candlelight. 4. Not really a blogosphere link, but just in case you were looking for a little deep reading about Olympia, here comes the Community Renewal Area. I'd explain it, but I'm mostly just posting it here to remind myself to read. Also, Walt went to one of their meetings and taped it. 5. A starling died in Mojourner's front yard. Good for you Mr. predator bird, kill that foreign interloper. It seems like we might be in the habit of doing this every decade or so in Washington State, bringing back the legislature to make sure Boeing doesn't leave Puget Sound high and dry. The risk of losing Boeing to some other state is an interesting case of regional tension, especially in how Colin Woodard describes regions in American Nations. Right now, at least on their commercial airline business, Boeing is company with deep Left Coast roots. But, in recent years, Boeing merged with another aerospace company from Great Appalachia (McDonnell Douglas). Since then, they have begun using the political and economic culture of the Deep South to gain concessions from their Left Coast home. This contrast between their Left Coast origin and Deep South destiny is interesting. On the surface, the Left Coast (home of Portlandia, hippies and Starbucks) seems like the perfect anti-corporate foil to the open-for-business Deep South. But, as Woodard points out (and the Boeing legislative package illustrates) there is a deep vein of pro-business sentiment in the Left Coast. The Left Coast was founded in part by New England capitalists, who built the region on large timber empires. This timber baron sentiment led directly to the founding of companies like Boeing. It was also based on a close understanding with civic leaders to do what was needed to keep people at work and business growing. The other founding group along the Left Coast is the Great Appalachians. They could also be described as pro-business, but as expressed in the founding of Oregon, not exactly pro-big business. So, while companies like Boeing stayed home grown they were happy enough to stay out of their way. But, along with these various pro-business strains in the region, the Left Coast also developed a strong sense of civic mission (at least in urban areas) and environmental protection. Beginning from its Charleston beachhead, the Deep South spread apartheid and authoritarianism across the Southern lowlands, eventually encompassing most of South Carolina, Georgia, Alabama, Mississippi, Florida and Louisiana; western Tennessee; and the southeastern parts of North Carolina, Arkansas and Texas. With its territorial ambitions in Latin America frustrated, it dragged the U.S. into a horrific war in the 1860s in order to form its own nation state, backed by reluctant allies in Tidewater and some corners of Appalachia. After successfully resisting a Yankee-led occupation, it became the center of the states-rights movement and racial segregation, as well as labor and environmental deregulation. It is also the wellspring of African-American culture in America and, 40 years after it was forced to allow blacks to vote, it remains politically polarized on racial grounds. For all our pro-business culture (we built Microsoft, Weyerhauser and Boeing), we Left Coasters also have a strong sense of unionism and environmentalism. This is the New England sense of community values expressing themselves in our culture. We also have an Appalachian sense of fair play that is questioning special deals for few large companies. So, where is a company supposed to go to get away from all Left Coastiness? Well, Charleston, the birthplace of the Deep South! At first blush, I was confused by the election results for the Olympia city council. Across the two contest races, I assumed there would be some difference between the four candidates that ranged across the city's political spectrum. In one race, we had a fairly right candidate (Mike Volz) against a neighborhood based centrist (Julie Hankins). And, in the other, we had downtown business centrist (Cheryl Selby) against downtown business further left (Darren Mills). Both Selby and Hankins won their races by health margins, showing an overall preference for centrist, I suppose. Even if you look at the precinct level results, both Selby and Hankins both had nearly clean sweeps across the entire city. Mills only won a handful of precincts and Volz didn't win a single one. 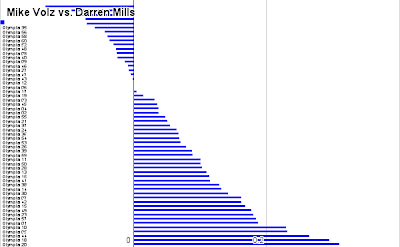 What was shocking to me, was that even on the precinct levels, the margins of defeat for Mills and Volz were similar. Meaning, it is possible (though unlikely) that the same voters who chose further right Volz also chose further left Mills. I think this phenomena is more a trick of the numbers. While voters overall went for the centrists, I don't' think there's much cross over between Mills voters and Volz voters. Take a look at the precincts each did well in across the city. There is a distinct geographic pattern. Mills won precincts (in green) in the upper eastside. While Volz (in light red) didn't win any precincts, he did better than 40 percent in ones along the outer edge of the city. Even in the eastside precincts where he made a point of emphasizing his opposition to a homeless shelter, he did no better than 35 percent. Here's another way to look at the base of both candidates. I compared how well each one did in each precinct and charted it. Volz beating Mills in on the left, Mills beating Volz on the right. As you can see, the votes weigh much heavier towards Mills. Across the city, many more voters and neighborhoods chose Mills when they were comparing him with Selby than Mills did against Hankins. So, I doubt there were very many voters that chose Volz and Mills on the same ballot. They just both lost to strong centrist candidates by about the same percentage.. I've been toying with this idea of there being a special sort of political spectrum in Cascadia. It would be along the lines the circle political spectrums you see from time to time, where the conservative and liberal wings join at the top and bottom, implying there are two political centers. I'll try to explain this later, but the moderate middle right join would include elements of suburban, government and business friendly themes. Everyone works together to make a happy life. And, where the ends meet at the bottom, the more extremes of the standard left to right spectrum would join together with elements of traditional Cascadian anti-corporate, anti-oppressive government themes. Anti-corporatism on the left and the right is actually a long held position in Cascadia. It was one of the original fights in founding Oregon. So, while its fun to sketch out little theories like that, its even better to find real world examples. Right now, Sue Gunn is leading Jeff Davis in a tight Olympia port commission race here in Thurston County. Even though its the Olympia port, the elections is held county wide. Over the course of the race, some political observers have had a hard time putting their finger on Gunn's position in the political world. If she was a liberal, why is she against a tax supported county-wide port? If she's a conservative, why is she such an environmentalist? This year, Red Sue is a hardheaded fiscal conservative, preoccupied with lowering taxes and running the Port of Olympia at a profit — or so she says in Works in Progress and on her campaign website. But on an environmentalist website, she’s Green Sue, claiming that she’ll refuse all timber and proppant contracts because they’re bad for the environment — thus depriving the port of several of its most lucrative sources of revenue. This would cost quite a few jobs and increase our taxes, the very thing Red Sue deplores. But not to worry, Green Sue proposes to close down the marine terminal entirely and turn it into a park. This certainly would be true if we were on a flat spectrum, but in a round one, Gunn could find a comfortable spot near the bottom, where the libertarian left and right join together. Coincidentally for us, its also easy to find this mapped out in the early results. 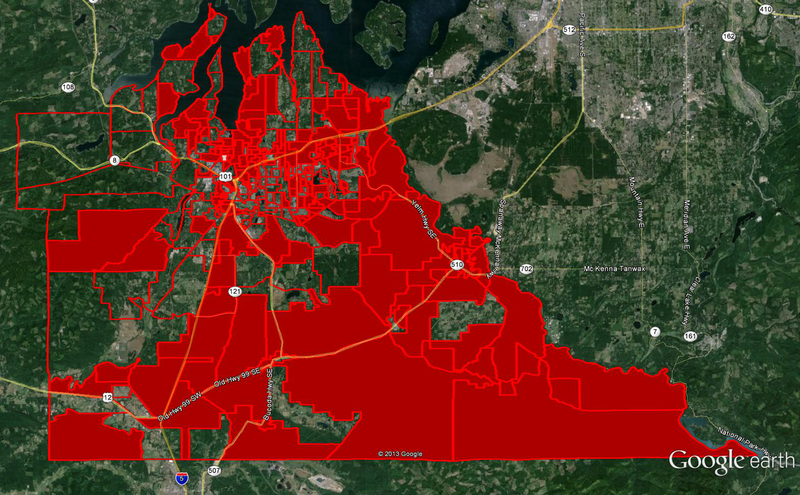 The most traditionally conservative (Republican) areas of Thurston County are in the south of the county. 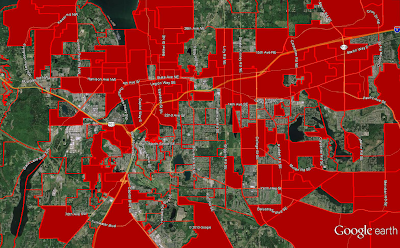 The most traditionally liberal (Democratic and left of Democratic) areas are in urban Olympia and the west side. So, this map showing Gunn winning in both rural south county and urban Olympia illustrates here campaign bringing together these camps. 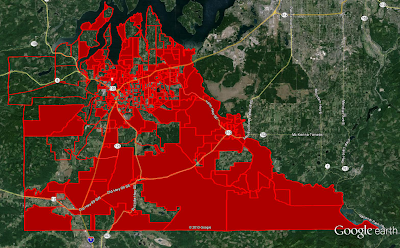 This is not a traditional election map in Thurston County, by the way. When you zoom in on Olympia, you really see the detail of her victory. 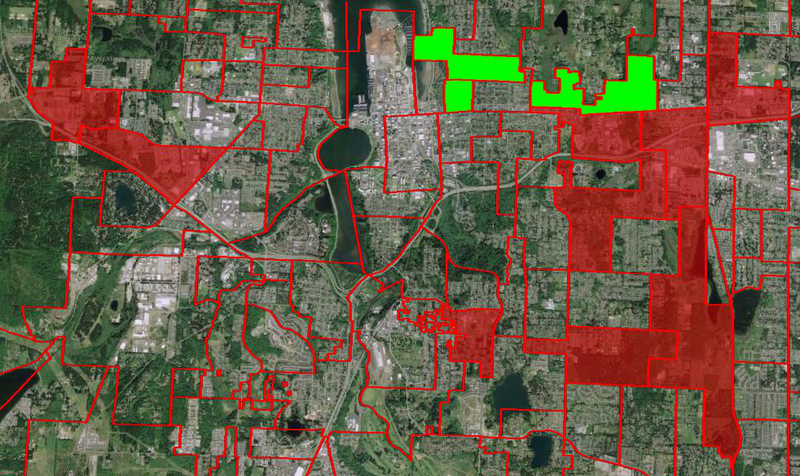 You can see a band of Jeff Davis areas surrounding Gunn's urban vote. But, in turn, surrounding those suburban neighborhoods, you see much more conservative rural areas. 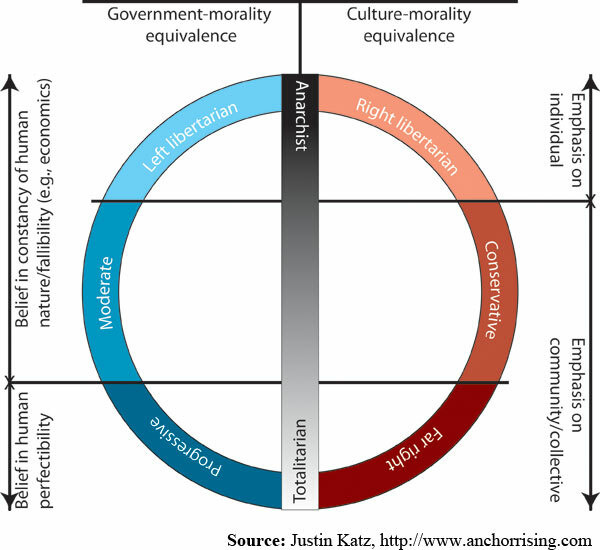 In her apparent victory, Gunn was able to move the political center from the typical moderates the lean both left and right on a political spectrum, way to the other side of the circle. Her victory was based on liberals who didn't like the direction of the port using public money to support private interests and conservatives who felt the same way. 1. A whale came south to Snazzy Bouquet's inlet. 2. Ken tracks the downward trend of the print Olympian. 3. Calavara writes about what he donated to the OFS charity auction.